Cinema goers in Scotland can take particular interest in The Promise, released this Friday. Directed by Terry George (Hotel Rwanda, In the Name of the Father) and starring Christian Bale and Charlotte Le Bon, Hollywood’s latest big-budget epic presents a slice of 20th century history that powerful interests have long fought to suppress: the genocide of 1.5 million Ottoman Armenians between 1915 and 1923. A century later, the issue still divides the international community. Scotland took a stance in 2013 when MSPs from all parties officially recognised the Ottoman policy of genocide against the empire’s two million-strong Armenian population. Holyrood’s vote put Scotland on the same list as Germany, Canada, Sweden, Poland, Italy, Argentina, Brazil and 21 other countries. Armenian genocide denial is a crime in Switzerland, Slovakia and France. Other devolved and federal bodies who recognise the genocide include Wales, Northern Ireland and 48 individual state legislatures in the USA. Yet there is an opposite list of governments who still refuse to recognise the extent of Ottoman criminality, and that list includes the UK, the USA and Israel. All three governments cite the same reason: political pressure from Turkey. For post-Brexit UK, Turkey is a ‘priority export market’ for arms sales. US President Barack Obama pledged in 2008, ‘If elected president I will recognise the Armenian genocide,’ but he broke his word, unwilling to upset a key ally. (This week, the Obama administration’s ambassador to the UN Samantha Power publicly apologised for that failure). In Israel, the issue sparks fierce controversy, not least given the clear parallels with the Holocaust, but political expediency wins out. 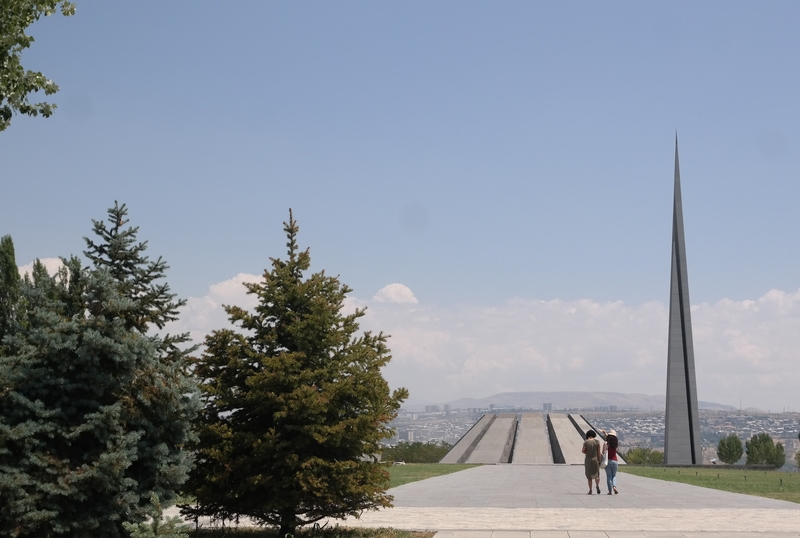 In Turkey and Azerbaijan, genocide denial remains official policy. Turkish nationalists have spent decades silencing debate so that most Turks are not aware that it occurred. President Erdogan has recalled ambassadors (from France and the Vatican) and heaped scorn on governments that accept the views of the International Association of Genocide Scholars and other historians. By contrast, in neighbouring Armenia, the struggle for wider recognition of the tragedy remains a pillar of foreign policy. For Hollywood to throw its weight behind the campaign is significant. The Promise offers the Armenian genocide the full Hotel Rwanda, Schindler’s List, and the Killing Fields treatment, but with one key difference: while those films dealt with events that were globally recognised, in this case, the fight is far from over. The wider campaign is not just conscious of the past, but forward-looking in its aims, which include calling out contemporary genocide and supporting humanitarian work globally. Last Monday, campaign leaders the Aurora Initiative for Humanity announced the finalists for the second annual Aurora Prize for Awakening Humanity, an award whose judges include former Irish president and UN Comissioner for Human Rights Mary Robinson, actor George Clooney, New York Carnegie Corporation President Vartan Gregorian, and a string of Nobel laureates and international human rights defenders. The Armenian genocide sparked a mass movement of refugees, and the international response at the time, especially in the USA, gave birth to the modern humanitarian movement, according to the Aurora Initiative. They say that the history teaches us how to respond to the modern refugee crisis. Frequently overlooked, the story of the Armenian genocide is about to receive much-needed publicity worldwide, thanks to Hollywood’s intervention. It is not just the past but the on-going battle over the legacy of 1915-1923 that is at stake. Armenian genocide recognition is a matter of conscience for some, and of strategic and cynical interests for others. Turkey must be on the “naughty” list.